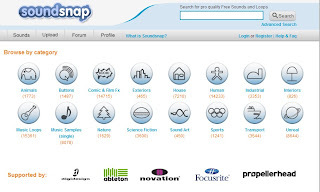 Soundsnap is a free online sound library and community for sound designers and producers. It collects lot of sound records included different kind of sound, like nature, animal, human, transport, unreal, and so on. They are all free for download. You can search its search bar to search sounds, or browse it by category or tag. You can preview and listen sounds by a simple player before download. It is nice option if you are looking for some sounds for your website. Soundsnap is an online community, it also allows upload your own made sounds and share them with the world.